In the kitchen of Finnbar's Pub in Troy the cooks have a well loved copy of The Country Cooking of Ireland by Colman Andrews. The story of the book itself is fairly interesting, in how an American came to write this James Beard Award-winning book that elevates the simple rustic food of Ireland. If you are familiar with boxty, it's most likely you know the dish as a potato pancake that's fairly similar to a latke. However, the old Irish verse, "Boxty on the griddle, / Boxy in the pan, / If you can't make boxty, / You'll never get a man." implies that there are different preparations for this potato centric dish. For the most part boxty are a combination of mashed potatoes, grated potatoes, and wheat flour. These form something between a dough and a batter. The most popular is fried in a pan as a potato pancake. But the dough can also be boiled to make dumplings or baked into a loaf that resembles bread. A less traditional variation involves a thinner batter that's spread out to make a boxty that is more akin to a thick crepe, which can then serve as a wrap for a savory filling. It's this last, unusual -- but still entirely Irish -- form that's available on the menu at Finnbar's in Troy. 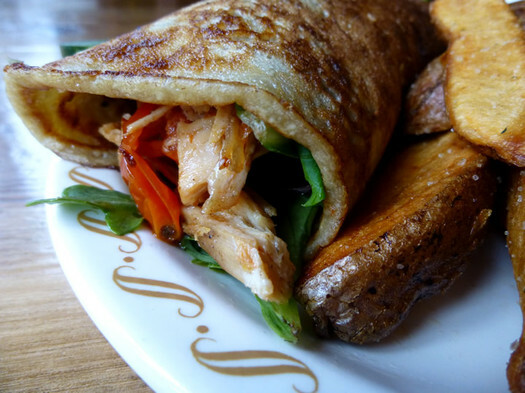 They wrap their boxty around well-seasoned, hand-pulled roasted chicken, tender greens, and a tangy vinaigrette. When I visited the bright dressing was spiked with lemon and thyme, but it changes periodically based on the whims of the kitchen. Eating this was more of a fork and knife affair. 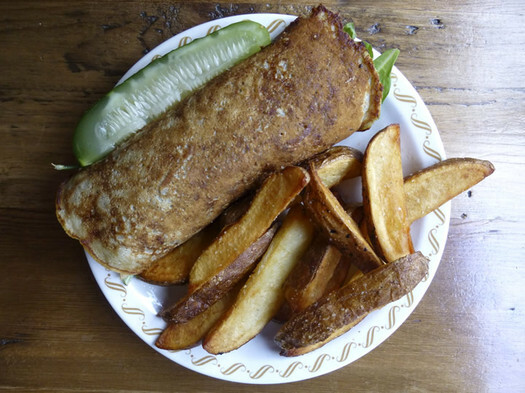 The wrap is open on both sides, and while the boxty itself can contain its contents, I wouldn't trust its structural stability when stuffed full of meat. In some ways the experience was redolent of Ethiopian food where one eats savory foods enrobed in a thick piece of tender injera. Except the boxty is neither as spongy nor sour as its African counterpart. Instead, it's more like a cozy blanket of soul-soothing starch. If not for the well seasoned filling and some much needed acidity, a boxty could be an exercise in blandness. But the one at Finnbar's Pub is delicious. It comes on a plate with hand cut fries (they call them chips, they're potato wedges) and a crisp pickle spear for $10. Yeah. That's a lot of potatoes, and those spuds have a way of sticking with you. After skipping breakfast, and having this for an early lunch at 11:30, I wasn't even remotely hungry until dinner time. That never happens. If you were ever wondering what happened with chef Josh Coletto, formerly of The Flying Chicken, well he's now a part of the kitchen team here. I dropped in on him and watched as he made orecchiette by hand from durum semolina flour for the Baked Mac N Cheese. That $6 dish has to have the highest labor cost of anything ever. 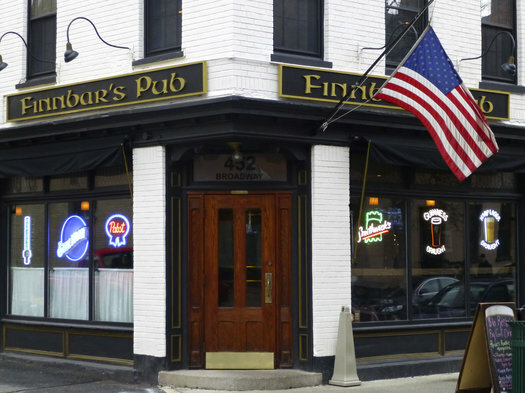 But it is just one of many examples of the surprising level of care that's taken in making the food at Finnbar's Pub. In the future Coletto says the menu will be changing, but the boxty will remain. The kitchen will start to have more fun with it and periodically change the fillings. However chef Josh advised that on St. Patrick's Day Finnbar's will only be serving a limited menu, and that means no boxty on March 17. That's okay. As opposed to corned beef and cabbage, this is something that you might actually want to have more than just once a year. I LOVE Finnbar's Pub! The staff is so wonderful and attentive, and the food is excellent! It's so nice to see such an awesome write up about them. I love Finnbar's Pub! And I want some boxty right now! Sounds like a great place. Too bad it's in Troy. I usually like Daniel B. 's posts. But why does he take four paragraphs before he starts reviewing the restaurant? And why is he correcting Finnbar's name for the chips? I live in Troy. It's a great, under appreciated city, made better by pubs like Finnbar's. @FussierThanThou: Yeah, sometimes Daniel B. can be a bit fussy, but his reviews are usually spot on. Thanks for the post -- I'll try some boxty tonight. That looks delicious. I am a bad Irish(wo)man, in that I've never heard of boxty until you mentioned it to me! Stopped in a couple months ago for a drink, and the thought of something to eat. Sean, the owner, made clear the quality and care taken with the menu, and deciding to eat there was easy. No disappointment at all. Bob wins comment of the month!